It is so hard to know what ‘organic’ really means anymore, here in Australia we are lucky to have one of the highest ranking certification bodies in the world. At The Divine Company our products are proudly ACO Certified. Australian Certified Organic (ACO) is Australia’s largest certifier for organic and biodynamic produce. The ACO’s certification program and protocols are approved and accredited on a national and international level, and have been approved by the Department of Agriculture & Water Resources, the US Department of Agriculture, IOAS, Japan’s Minister for Agriculture Forestry & Fisheries, Korea’s NQAS’s and SAI Global. This means our products have been tried, tested and undergo regular vigorous checks with one of the leading certifiers in the world. Our products and the ingredients in those products must follow some strict rules. We obtain valid organic certificates for all certified ingredients. This ensures that the farm has been following Certified Organic practises for a minimum of 3 years before farming the ingredients used in our products. Non certified ingredients are generally permitted when certified ingredients are not available on the market. However non certified ingredients cannot: be of GMO origin or manufactured using GMO technology, be fumigated or treated with compounds prohibited by organic standard, cannot exceed 10% of other contamination MRL as defined by FSANZ, cannot be irradiated. We must obtain and supply ACO with proof non GMO, Irradiation and treatment statements for non organic ingredients. This means even if a few of our ingredients are not Certified Organic they are sustainably sourced and environmentally friendly. As much as we can we source Certified Organic ingredients and most of our products contain 95% or higher Certified Organic ingredients. There are a few ingredients we are not able to source, water is an example of an ingredient that cannot be Certified Organic. With our non certified organic ingredients we do follow the strict rules to ensure our products are made from the highest of quality. 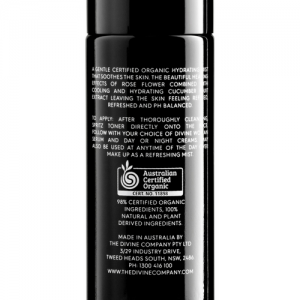 Our products all proudly contain 70% or more Certified Organic ingredients.